Manchester United's interim boss Ole Gunnar Solskjaer is prepared to sanction the sale of Marouane Fellaini before the closure of the winter transfer window. The Belgian signed a fresh two-year deal in the summer after the insistence from ex-boss Jose Mourinho and featured in 13 of the 17 league games with the Portuguese at the helm. However, since Mourinho's departure, he has managed less than 30 minutes of action under caretaker Ole and TalkSPORT claims that he could be shown the exit door before the end of the month. 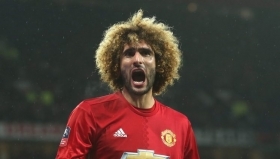 Fellaini was the subject of interest from AC Milan during the summer and the Rossoneri are being fancied to retain their interest in the Belgian, who could be available for a cut-price fee. Aside from Fellaini, there have been question marks raised over the future of Antonio Valencia with Ole recently confirming that the Ecuadorian was simply dropped from the matchday squad against Tottenham Hotspur.